The subject of our talk during the evening walk today was near by places for a weekend trip from MYSORE.Today paper says Jog is wonderful to visit this season and it is on the list for next weekend said a friend of mine. Jog falls is in Shimoga district of Karnataka. Not very far from mysore and so ideal for a weekend trip. I was told by my family that this Joga Jalapata ( Jog falls, is fromed by River Sharavati, and falls from a height of some 830 feet, which is about 253 meters andso is the highest plunge water fall in India. Raja (King): Named so because of its apparently 'dignified' and 'serene' fall. Roarer: This stream appears out of a mass of rocks, making a tremendous amount of noise. Rocket: Consists of a large volume of water streaming out of a small opening at a very high speed. Rani (Queen), also called Lady: The stream has a winding, twisting trajectory, said to resemble the movements of a female dancer. The world famous Jog falls has begun wearing a new look. The splendorous falls provides an enchanting view as it falls from a height of nearly 890 feet. The falls, which is usually crystal clear, has turned red with the release of nearly 60,000 cusecs of muddy water from the Linganamakki Reservoir. The reservoir is said to be receiving nearly 1 lakh cusecs of water following incessant rains in its catchment area. The flood situation in parts of Honnavar in Uttara Kannada district in the downstream may worsen if the discharge from the reservoir exceeds 2 lakh cusecs of water. 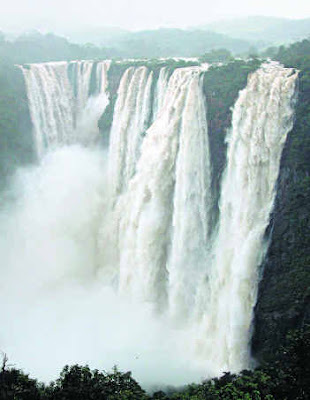 However, for the Jog Falls will make for a scintillating sight. As it usually does our talk then drifted to what was on the menu for dinner at each ones place. As one said she would prepare pasta ,I was reminded of Pasta with white sauce and vegetables that I had not cooked in a long time. With all ingredients it can be cooked in a jiffy. It did taste good I should say. This tasty dish can be cooked in few simple steps. 1. Cook pasta and keep aside. 4.In another deep bottom pan, melt the butter, stir in the flour... when it is slightly done add the cheese ,stir fried vegetables, salt and pepper to taste. 5. Add the steamed vegetables. 6. Cook well adding milk all at one and cooking over medium heat until it thickens. 7.Mix with the cooked pasta and serve hot. In a small melt butter. Stir in flour. lots of info abt our jogfalls..
@swaram, thanks for the appreciation.I try to write but your blog is too good a read... I am from Mysore, and yes it is the best place in the world.